Finding ad inspiration is easy, but it can be more difficult to find inspiration for nonprofit advertisements. Many popular online ad showcases do not include a “nonprofit” designation for browsing or searching, which means that on those sites you have to sift through seemingly endless pages of for-profit advertisements to find a few good nonprofit ads. Fortunately I stumbled on a few sites such as Osocio, a blog that features “the best of nonprofit advertising and marketing for social causes.” It’s a great place to start if you’re seeking creative inspiration for nonprofit ad design. Case in point: the following 30 creative nonprofit ad designs. This ad makes its point in the copy, which goes unread by too many. This WWF ad forms a polar bear, shaped by the continents. How much of the world’s land is truly open to free-roaming animals? This ad tells a bleak story. This clever campaign urges the public to donate books rather than throw them away, and features homeless fairy tale characters to make its point. Anti-war sentiment expressed via a tank made from bones. Red Cross used this design to promote blood drives to benefit Japan. This set of creative door hangers educates individuals on specific rainforest issues. This advertisement made it appear as though street paint was marketing bicycles as a preferred mode of transportation in New York City. This advertisement makes the point that it’s easy to convince children that killing is a game. Another Greenpeace ad, this time the relatively simple lends itself to powerful copy. This tongue-in-cheek campaign demonstrates the hardships people have to face in order to provide corporate tax cuts for rich banks. Children with cancer can find every aspect of life difficult; often the things we take for granted. Israel and Iran would be popular vacation destinations for each other, if only they could keep the peace. Another War Child ad, this time promoting the idea that where childhood thrives, war does not. The anti-torture organization places these ads in newspapers to gain awareness for torture victims. The Royal Parks Foundation encouraged the public to enjoy the great outdoors with this ad, which asks readers to ponder whether their lives are more interesting than a squirrel’s. The plastic-wrapped sushi demonstrates the dangers of dumping into the ocean. IFAW asks if we’ll allow endangered species to extinct, so that the only thing left of them are their names. The human race should consider itself as part of the animal kingdom, not above it. This advertisement encourages the public to drink healthy beverages. A play on a well-known phrase creates meaning for this advertisement. This Brazilian-based ad campaign relates how ruining the environment has drastic consequences. This ad promotes awareness of the fact that wildfires not only kill trees, but the animals that depend on them. Demonstrates how the victims of cocaine aren’t limited to its users. It’s time to save the earth, starting now. Amnesty International protested the 2008 Olympics in Beijing due to China’s history of human rights violations. 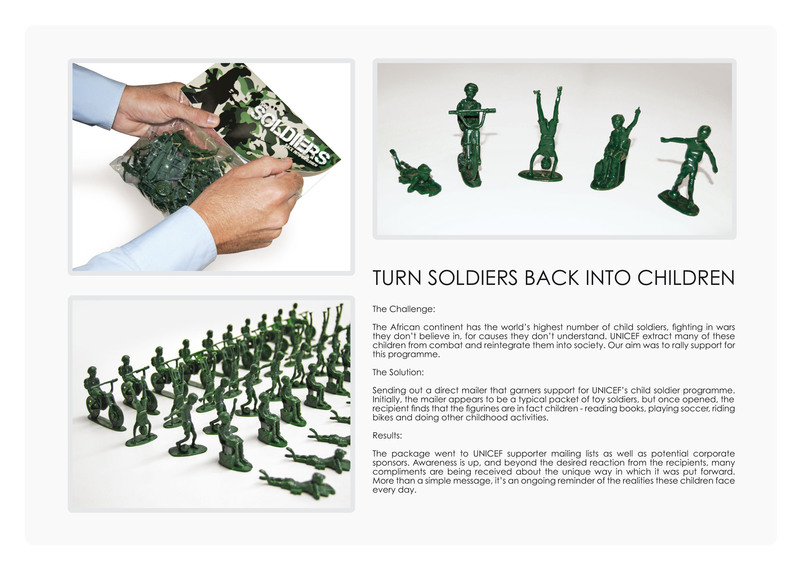 UNICEF protested the recruitment of children as soldiers with this direct mailer. This nonprofit demonstrated that it works to care for animals with this advertisement. This ad served as a recruitment for physicians to join Doctors Without Borders. The only place we want to see this image is in a museum.